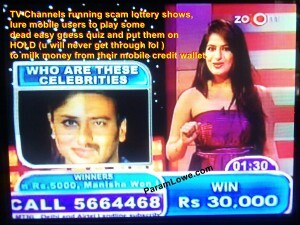 TV Channels running scam lottery shows, lure mobile users to play some dead easy guess quiz and put them on HOLD to milk money from their mobile credit wallet. Your call will never gets through. this is deliberately done to stretch you calling cost as they get their margin from the amount you spend holding on your call. Only some studio fake call are shown on their show. The callers are usually the persons siting inside studio itself and they will answer wrongly to prompt you to think that its so easy and you are the only one who will answer it correctly and win the money shown on this show. This is 100% fraud tactics and its a scam and the hidden parties are the telecom connection providers. Do not make calls to such shows see the picture posted in here even a five year old kid will guess it that one half of photo is Indian actors (Bollywood’s) Kareena Kapoor and the other half is Ajay Devgan.